N8tr0n got home late last night after a quick business trip to Northern California. We only saw him for a few minutes this morning before he went to work but I can certainly tell we are happier when he is around. He brought Z-cakes a present; one of those pens with all of the different colors built into it. She played with it for a solid 45 minutes after he left. My present was two loaves of sourdough bread. Yessssss! It went perfectly with our homemade strawberry jam (which, by the way, turned out perfect) and I shall be eating it for breakfast, lunch, and dinner until it is gone. I've been contemplating learning to make my own sourdough bread and perusing this site more than is probably necessary. Do any of you make your own sourdough bread? If you have advice, do tell. I'm all ears. And while we're on the subject of baking, I've decided that I need a wood fire oven in our back yard. Yes, yes...I should probably start saving for one of those yesterday. I'll be back this evening with my 12 on the 12th grid. Right now we have lots of being outside that need's doing. I'll probably move into your chicken coop if you get a woodfired oven. Consider yourself warned. 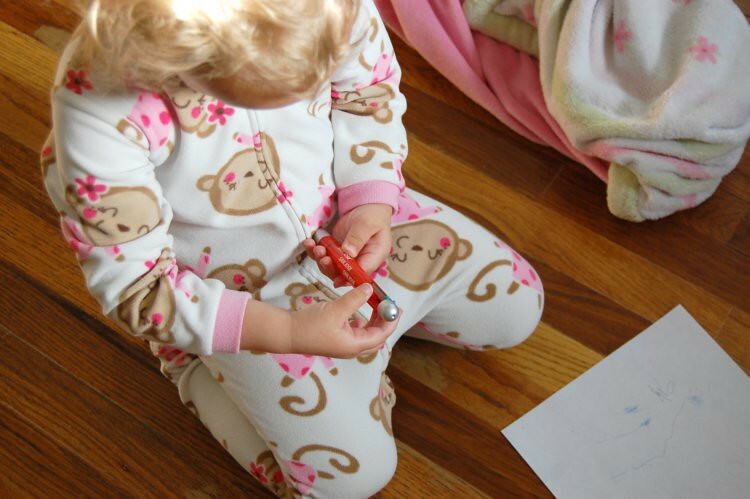 Don't you just love it when something holds kids' attention?! 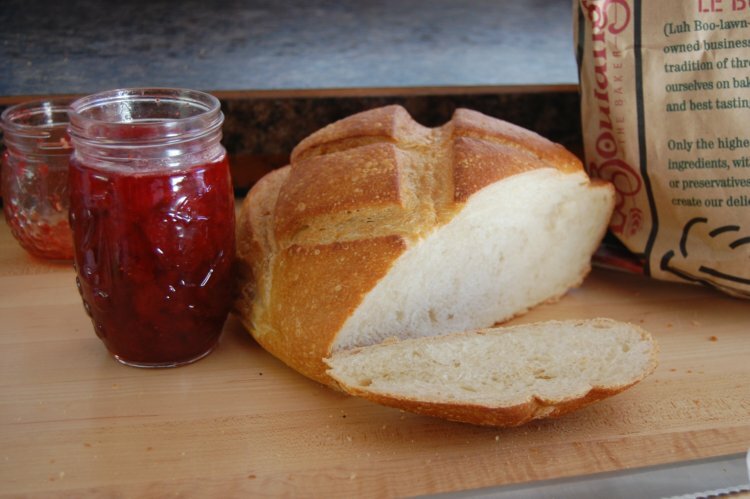 I would do just about anything for that bread and jam right now. sigh. We have some friends who built a bread oven in the backyard. It is seriously amazing. I too would give about anything for ha bread and jam. What recipe did you use for the jam? Strawberry is my most very favorite in the world. Timm has been working non-stop lately, and we are very most definitely happier when he is around. Which is practically never. Sourdough start can get a little persnickety with bread. We started out small, doing pancakes once a week or so to get our start up and running, and it made me a lot more comfortable than if I'd jumped straight into breadmaking. I highly recommend the Tartine bread book (interestingly enough, they are in S.F. and he's somewhat of a local demigod). His illustrations are awesome, his guidelines straightforward, and unless you are really dying to go with the backyard oven, the author teaches you how to make rustic bread in your own doggone oven. Whew! Sorry for being so wordy. Drop me an e-mail if you want to talk bread some more. There is no food I like more than sourdough bread! Yay for thoughtful husbands!